I am a bit obsessed with with all things galaxy! From galaxy candy apples to a galaxy tote bag, and everything in between! I was rummaging through my closet and found that I had an over abundance of plain white shirts so I decided to spruce some of them up! 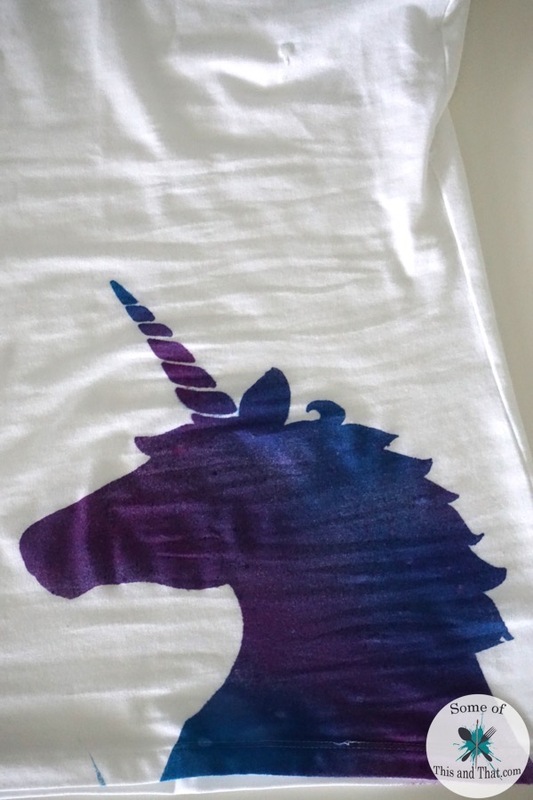 Of course the first thing I wanted to do was create a tie dye shirt, but not just any tie dye, a DIY Galaxy Unicorn Shirt! I absolutely LOVE how it turned out! You of course do not have to do a majestic Unicorn, any shape will work this project, but who doesn’t love a Unicorn? You only need a few basic things to make this project and the stencil is made out of freezer paper, which is super easy to work with when it comes to making a tie dye effect! And a template of your choice, you can find the Unicorn one that I used down below for download. 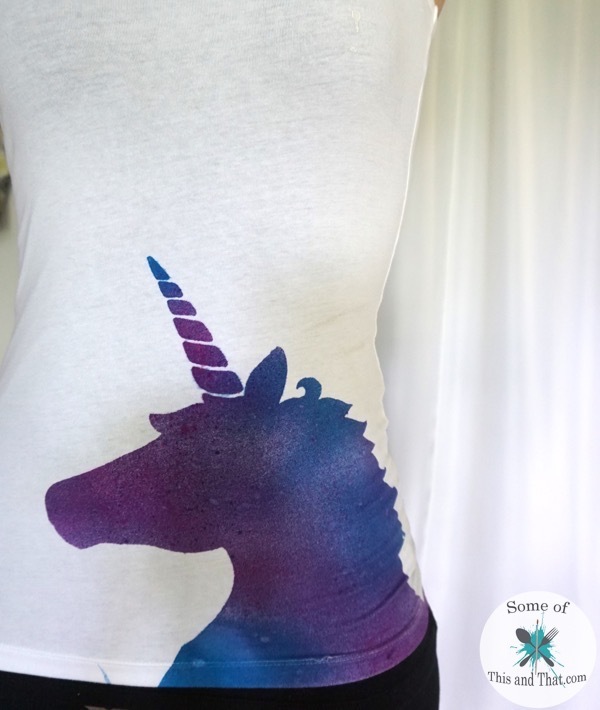 To learn how I made this super fun DIY Galaxy Unicorn shirt, check out the video below! What animal would you use to recreate this fun and easy shirt? Let us know if the comments below! Be sure to follow us on Facebook and Pinterest for more fun nerdy and geeky crafts and foods! Love my leggings? Grab them HERE! Previous Post: « Fruit Salsa Recipe! 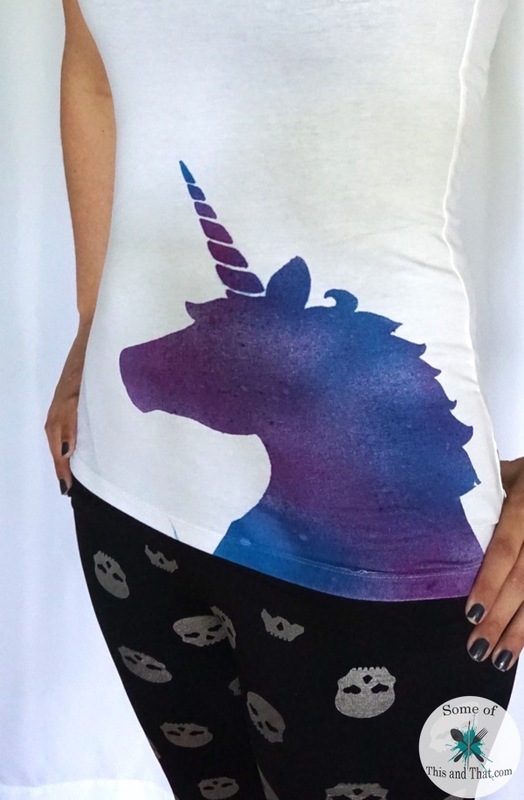 My friend and I are OBSESSED with unicorns and I’m going to tell her about this!!!! I love it!!! Awesome project! Did you rinse and wash it after it was dry? Worried about the tie dye colors bleeding. I followed the directions on the color dye that I used and have no issues with bleeding or fading. Just be sure that you read the directions on the coloring you use and you should not have any issues.